I love guitar books. I have about 50 of them lined up on in a bookcase in my teaching studio. I acquired them over the last 12 years, and I have twice that amount sitting in my Amazon wish list. I’ve only worked through roughly a third of the books I own, browsed and benefited from another third, and the rest remain in an ever-expanding queue awaiting my perusal. These days, I make occasional purchases not for myself but to improve my teaching abilities and recommendations to students. This inevitably gets new books in my hands that I wish to a deity that I could have seen when I was younger. 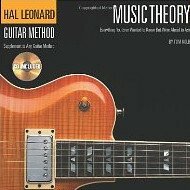 If you consider yourself an intermediate guitarist, starting to get a little more serious with the instrument, I encourage you to explore the following three great books. These don’t need to be read in any specific order. There’s a little bit of overlap in theory and fretboard shapes, but I think they complement each other perfectly. I actually bought this book in time to glean a wealth of advice from it. I consider it the ultimate gap-filler in an intermediate or advanced guitarist’s knowledge and abilities. It contains a hodge-podge of advice applicable to all areas of advancing via guitar into the world of professional musicianship. There are little tips on warmups, gear, recording, maintenance, basic and advanced techniques every guitarist ought to know, essential theory jargon and concepts, and introductions to a number of different playing styles. This is not a wildly popular book, but I think it’s the best one I ever bought. I’ve used and remembered for years countless (or… 101) handy tips and tactics I first read here. Having spent so many years studying songs and theory and scales and chords on the guitar, this book is of little use to my playing now. But it’s quite beneficial as a teaching aid; I regularly make copies of the exercises for my students to help them better understand the songs and concepts they’re learning. This is an excellent theory method book, complete with quizzes and worksheets. If you’re getting into music theory at all, whether by interest or necessity, I strongly urge you to take a look at this book. As with the fretboard, I learned all this stuff a bit painstakingly over many years. I absolutely loved it, but it wasn’t a very efficient process. I learned music theory from fellow users on internet forums, poorly-written websites, and poorly-written books. All the info was there, and I figured it out eventually, but it could have been so much easier. This book gets that job done. The writing, diagrams, and exercises are all top notch.